Al Koran. A GREAT new book! It is no secret to my readers that I am a huge fan of the late Al Koran. When I play the “I wish I had got to see xxxxxx perform live….” game, Koran is always the first man on my list. No one even comes in a close second. For many years, the two classic Koran books were the chief source of information for those of us who were trying to learn the secrets of the master. Wonderful information, advice and routines were contained in those two slim volumes. They are still valuable and beloved residents in my bookshelf. Recently my friend Martin Breese has done a wonderful job in updating the available reading matter on this iconic performer and magical innovator. 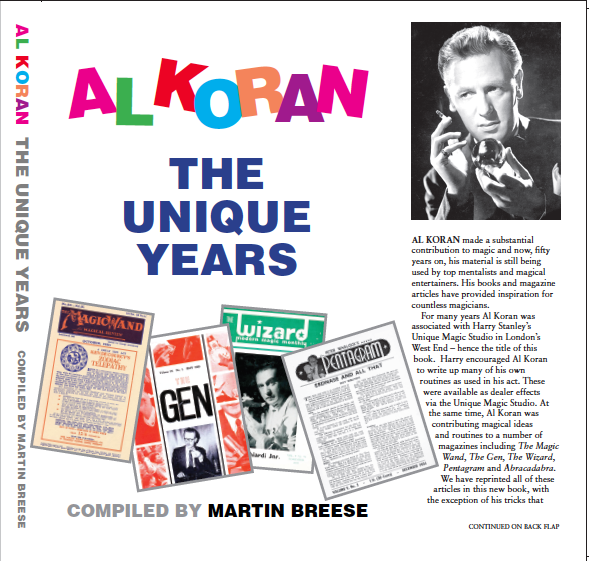 Breese must be really thanked by the magic community for his recent additions to our knowledge and understanding of Al Koran. He has added another classic book to the available treasure trove. I was delighted when Martin was kind enough to send me a PDF of his latest publication; I have found it to be a particularly fascinating volume. It gathers some rather obscure and extremely interesting material and turned it into a must-read book for fans of Koran. In fact, even if you have never had any interest in Al Koran because of his identification with mindreading, buy the book anyway—you may be in for a surprise. Don’t forget Koran was the man who created the basis and framework for Ring Flight! Before he became an almost instant star as a mentalist, Koran was a very sophisticated and accomplished sleight of hand/close-up performer. This book collects routines and effects that have previously only seen the light of day in magazines. What they really demonstrate is what a powerful tunnel vision Koran had for the structure and subtleties that can create a miracle. His ability to simplify an effect and maximize its impact reminds me of a diamond cutter taking something precious and transforming it into something as close to perfection as possible. The magazines that these particular gems were culled from include, ‘The Gen,’ ‘The Wizard,’ ‘The Magic Wand’ and ‘Pentagram.’ I particularly enjoyed one particular series of columns for ‘The Gen’ called ‘Kard Kolumns’ in which various moves are detailed and then a trick involving them is added to the mix. It should mention that not every trick in the book was originated by Koran himself, however his selection of material is enlightening all on its own. When you are sharing slices of the mind of magical practitioners like Alex Elmsley this is not a negative point! One entire section of the book contains many of the commercial effects that Koran released under the auspices of Harry Stanley’s Unique Magic Studio in London. A great deal of scholarly work went into patching these various instructions and manuscripts into a form suitable for release as a stand-alone book. The final section of the book details two routines that Koran released, after his relocation to America in 1969. I really enjoyed the highly personal and fact filled introduction to the book by Peter Zenner, which does much to fill in the personal legacy of this remarkable man. It goes a long way in revealing the real ‘taste’ of the man born Edward Charles Doe, who carved out a unique spot for himself under a new name. Did you know Koran performed a magical/musical act entitled ‘Song & Sorcery?’ I didn’t; and I found this a fascinating piece of information, especially given the reason why. Since receiving the manuscript I have taken the time to learn and perform several of the routines from this book and can report that they are pure gold. This collection has released great new/old material and is a true cause for joy for the performing magician. ~ by Nick Lewin on August 30, 2011. For what was basically a promotional (for the public) book it really was very good indeed.